This one is for the homeowners of Arlington, MA. With many lovely homes in the town, this one absolutely takes the cake because of its uniqueness. I think other homeowners would agree with the transformation that happened with this local Arlington home. The family decided that the igloo colored home just didn't appeal to their New England love jones. Changing the home color became a game time decision and to their credit it became the perfect play. Not even Doc Rivers or Bill Belichick could come up with a play that looked so good. The ending was everything they ever wanted. 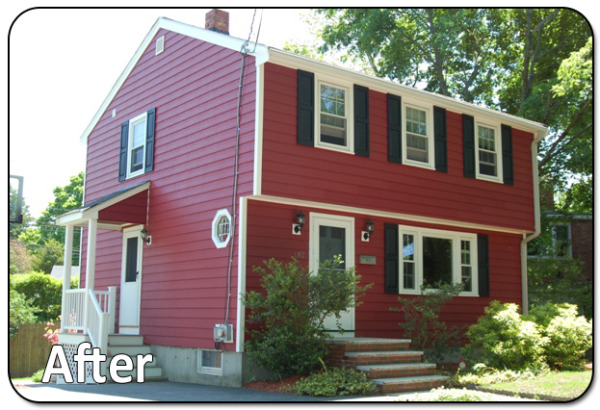 The family decided to remodel the entire exterior of the home with a 7-inch Cabernet Red colored Everlast Composite siding and the results were phenomenal. 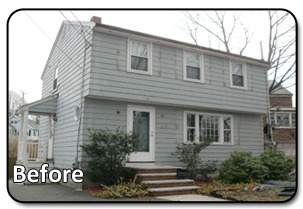 The home required a complete demolition of the old, worn cedar siding and shutters and were replaced with Everlast Premium composite siding and trim, all held together by brilliant, tough, stainless-steel ring shanked nails. Black shutters were added as well. I think its safe to say that Everlast Composite siding speaks for itself in this project. There are many factors to consider when choosing the right kind of siding for the exterior of a home. These factors..